For the last four days, I've hopefully laid the groundwork for you as you seek to plan your homeschool year with purpose. While I would love to sit down over coffee with each of you and help you navigate how best to do that with your specific curriculum selections and styles of homeschooling, I think we'd all admit that would make for a pretty busy Friday. That being said, I thought it might be helpful to address some of the questions I hear most often regarding scheduling. When do you start scheduling? How long does it take? We end our school year on the last weekday in May. With the exception of a few un-schooling activities, I generally try to take all of June OFF of homeschooling and give myself a chance to regroup and refresh. (Although, if I haven't ordered all of my curricula yet for next year, I use the emptier days of June to do that.) Then, starting in July, I begin my scheduling. I take one subject and one grade-level at a time...working on it here and there whenever I get a chance...usually at night when the kids are in bed or outside in a lawn chair while their playing in the sandbox or riding bikes. I rarely ever get an opportunity to just sit and schedule for an extended period of time. Each year it takes me just a bit longer to schedule than the year before as I am usually adding one more child to the roster. Somehow, it all gets done by mid-August and I can start gearing up for the big first day! What about delight-directed learning? Doesn't scheduling inhibit natural curiosity of a topic? I would argue that scheduling actually ENCOURAGES that style of learning. One quick browse around my blog will show you that there is no lack of DELIGHT going on here. Because the foundation of our day has been laid in a well-ordered schedule, we have the time to add LOTS of embellishments. At the risk of sounding argumentative, I'd challenge skeptics to tell me how much time is wasted each UNscheduled school day trying to figure out what should come next. Isn't it a better use of your time to employ each one of those precious moments in LEARNING...not figuring out what needs to be learned? I'd rather stockpile that time for my children so that they can use it to explore their own natural interests. In addition, by only laying a very skeletal plan for the entire year for certain delight-directed subjects like history and science, I can be free to change course every few weeks if I or my kids get the notion. What if your children get sick or you have to miss a few days? What happens when you get behind schedule? Please let me reiterate what I shared earlier in the week. A schedule is just a guide. It is not the gospel. It is not written in stone, only in pen. Do my kids get sick? Yep! Do I ever get behind? You bet! In fact, due to a month-long flu bug that waged war on my household this past winter, we missed over a week of school in one big chunk. Gasp!!! Now that we've established that, the next thought looming in your head, I'm sure, is what happens to all my pretty, well-ordered pages in my planner? As I've mentioned, I purposely plan in a handful of vacation days each quarter of our school calendar which are designed to be used as either a "teacher in-service" day or a "get caught up" day. In addition, we only do traditional school FOUR days a week. The fifth day is used for co-op and piano lessons. That being said, there are still a handful of hours on that fifth day that could be...if need be...used to make up a few subjects. In other words, I grant myself a few buffers when I am creating my school year calendar. If I happen to get behind, I continue forward motion in my schedule even though the dates may not match the ACTUAL day we accomplished those assignments. Eventually, we always work our way back to "right on track." I try to maintain forward motion of an ENTIRE school day at a time. I have no desire to be on one page in my planner for my math schedule and another completely different page for my English and reading schedule. That would defeat the purpose of having all the information in one place. In order to do this, I have to be willing to let some of the pre-written plans go by the wayside. I ask myself, "If I only had the time to do two things today, which two subjects would be on my MUST DO list?" For me, it is English and math. Because of the particular curriculums I have chosen, only English and Math require graduated skill levels. (Meaning, you can't move on to tomorrow's lesson until you understand today's. One topic builds upon the next.) For this reason, if we are behind and need to catch up, we try to at least do the bare minimum that is required for English and math and skip all the rest. Other subjects (especially unit study subjects), can be skipped that day and picked up tomorrow. For instance, if my son was scheduled to complete page 3 of his Critical Thinking book (The book I shared with you in video 2 of Day 3.) and he just didn't have enough time to get to it because we had to run to the doctor's office, I'd cross that page off the schedule and we'd pick up on page 4 the next time. It doesn't really matter that he did not complete page 3, because it is not connected to page 4 in any way. The same goes for art...and typing...and handwriting (sometimes)...you get the idea. The main point I am trying to make here is that you don't have to erase your entire planner and start over again. Just continue on in forward motion. I make school hours a high priority. But, I also know that sometimes it is easy to let school slide in order to accomplish things that may or MAY NOT need to be accomplished at that very moment. It has helped me to prioritize my time by referring to myself as a work-at-home mom. I try to maintain my school hours as a homeschool mom in much the same way as I did as a school teacher. Not that learning doesn't happen beyond school hours...but that learning DEFINITELY takes place DURING them. When I was teaching in a classroom, I couldn't necessarily zip to the grocery store to pick up a few things whenever I got the notion. I couldn't dash to the department store sale simply because I wanted to get a good deal on a pair of shoes. I had to wait until after school. While emergencies DO arise on occasion, (I run out of diapers, my child needs cough medicine, my husband left something at home and needs it for a meeting at work) I do all I can to preserve our school day FOR SCHOOL. For the most part, any errands I need to run are done in the evening or on the weekend. I choose the right planner for me. It never bothers me if my dates do not match up. But, if something like that would bother you, consider purchasing a planner that does not have dates written in it but instead has only blank scheduling blocks. That way, you will never have to feel confined to any particular date and therefore will never have to feel behind. What about if the schedule interruptions are frequent? What if my child has health needs that require many unscheduled days off? While I would love to be able to provide just the right answer to that very specific need, I would be remiss if I tried to speak with authority on a subject I know nothing about. I have never traveled that difficult journey and would never attempt to "have all the right answers." But, one of my dearest friends in the world HAS walked that walk. She spent nearly two years of her life living out of a suitcase as she traveled to and from a Ronald McDonald house three hours away in order to care for her precious baby...all the while trying to homeschool her other three children. She has graciously opened her heart and the pain of those few years in order to minister to you mommas who long for direction. If you begin the year already knowing that there will be many unscheduled interruptions due to health issues or other circumstances, only schedule two or three items IN your planner. Commit to winging it with the rest as you are able. At least you know you will have some stability with the two or three major subjects. If, on the other hand, the health concerns come unexpectedly mid-year, just IGNORE the non-essentials and only do the bare minimum of your written plans. Permanently pack "school" into the car. In her case, her Sweet One often had to be rushed to the hospital at a moment's notice. She would have to quickly pack a bag and usher her older children out for the three-hour drive to the hospital...never knowing how long THAT particular hospital stay would last. She quickly learned to keep certain school items/subjects stored in the car so that...when possible...they could all stay on track. Be willing to change curriculums. Recognize that you are in a very difficult season...one that requires flexibility and MUCH grace. Although it is WONDERFUL to have a schedule for your year, your days might be better managed without one. Be encouraged on those days when you feel like nothing note-worthy was accomplished, knowing that your children are gaining valuable knowledge by JUST LIVING LIFE in and around extraordinary circumstances. Do you schedule your toddler or preschooler in your planner? Preschoolers, on the other hand, I DO schedule into my planner but my plans look MUCH different than those of my older children. As I hope to do an entire post on this topic very soon, I will refrain from saying much more. Scheduling is a very individual process. While I can give you some tips and suggestions to help set you on the right path, you will have to find your OWN unique method. Allow yourself much pardon and don't become discouraged if you veer off track. A schedule is just a goal. It's something that has certainly helped me to manage my crazy-busy days, but it is NOT for everyone. If you'd like to begin scheduling for the upcoming school year, I'd suggest starting with the purchase of a great planner. I use and love The Well-Planned Day Planner and it just so happens that I've got an EXTRA one to give away! If you're interested in having one of your own, be sure to head on over to enter to win a FREE copy! Day 1: WHY I Schedule My Entire Year? Thank you for this series! It has been very helpful! This series was very refreshing and encouraging! It's nice at times to just go back to the basics and be reminded that things can be simple. The biggest thing I took from this series is "The main point I am trying to make here is that you don't have to erase your entire planner and start over again. Just continue on in forward motion." I'm going to use that golden nugget throughout my year. Forward Motion! Onward and upward! Thanks for reading this week. Jamie, I clung onto that exact same phrase: forward motion! Haha! I've actually already begun using it i reference to other things lately. Thanks for sharing a slice of your world with the rest of us. I found many practical ideas. I feel much more confident in taking all the pieces of the curriculum I have purchased individually and weaving them into one plan. I had thought planners were a "frilly" extra and had made grids and calendars over the years. Also did the refer to each instructor guide individually to hopefully get all the lessons in. Now, I can see there is more value in having all the work in one place to refer to and it really isn't an "extra" at all. Learned lots, and appreciate your efforts to share what you know works for you. You're most welcome. It's all about simplifying really. A schedule makes my day so much more simpler. What an inspiring series! Thank u for sharing. I've been doing a similar type of scheduling right in my MFW teachers manuel for years! Its nice to be more open and go. Wholeheartedly agree! Thanks for reading! Excellent series! Thank you very much! Just posted this series on our homeschool group facebook page. Way to go, Jamie! While you and I do things differently, I found this to be very helpful - especially the last day. Thanks! Thanks for sharing. Different is good! Homeschoolers certainly know a thing or two about "different". BTW...how's that blossoming belly of yours? Are you counting down days yet? Thanks for this series! It would be great to have it all together as one "book". Great series! Good timing too as we look ahead to next year! I've been following your blog for some time but I don't normally comment. I'm an introvert even on-line. :-D Great series. I got a lot of ideas for planning out the school year that I'm excited to try. 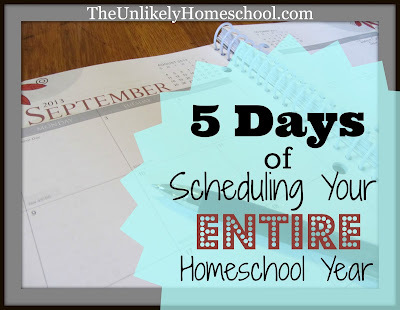 We are finishing up our 6th year of homeschooling and I still don't feel I have a great schedule figured out. And maybe there isn't one. lol It seems to change every year. This is our second year teaching year round, working 3 months then take a month off and so on, and still working the kinks out of the schedule. Love your blog! Although I am quite an extrovert, I can certainly appreciate your being an introvert...two of my best friends are introverts and I think that's why we get along so well. So glad you enjoyed the series. 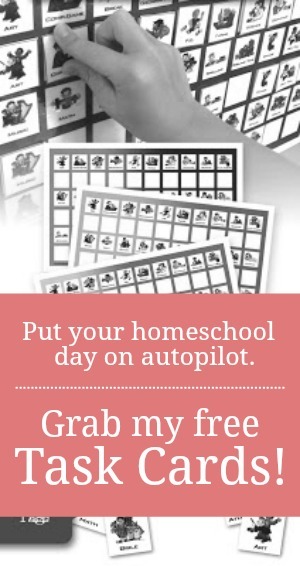 I hope it gave you a few ideas to tuck away and tweak to fit the needs of your homeschool. This has been such a fantastic series, Jamie! One I will be coming back to often, I think. We are about to complete our first year of homeschooling, but since I have only one school-age child, I didn't use a planner this past year. Next year, though, I think I need to start using one as I will be doing more formal preschool stuff with my 4-year old as well as having a 1st grader. Thanks for all the work you put into making the videos and breaking everything down step by step. You have no idea how much I have appreciated this wonderful series. Although I homesvhool our four I love the more in depth planning you have shown- my weekends seem to be so full of planning at the moment. We are half way through our s hool year, but I think I will use these next 3 weeks of holidays to plan the full second half of the year in more detail! It takes some getting used to, doesn't it. My ipad and I have a love/hate relationship most of the time. So glad you found the series. I hope your planning goes well. I am currently trying to find the perfect homeschool planner and came across your blog. When I came to the link you have for your favorite planner I clicked on it only to be told it's no longer there. Can you please tell me what planner you use? I'm sorry. That was the link to last year's planner. I have the link fixed now. It should take you to the main page. I buy the Well-Planned Day planer. I have been homeschooling for close to 20 years now, but it's been more like "unschooling" as I've not been good at planning. My children have learned tons, but sometimes it's been hit-or-miss. This series has really helped this right-brained person to see the step-by-step process of being more intentional and I thank you. Thank you so much for your videos! It has enlightened me and I don't feel as stressed about HOW to schedule our year! But, one question...how do you keep each child's plans for the day separate? For example, how would I keep my second grader's plans separate from my kindergartener? The planner that I use has space for four different learners for each subject. I assign one color of ink pen for each of them and write their individual assignments in their individual colors.